I hope that London doesn’t turn me into one of those annoying London writers who only writes about London. I’m going to try to write more often now that my MA is well and truly finished. Unceremoniously submitted, after much hand-wringing over supposed self-plagiarism. It turned out that Turnitin believed my bibliography was copied from my previous essays on similar topics. God forbid that I should try to consistently cite my sources. A redorange London Ribs boat buzzes by. 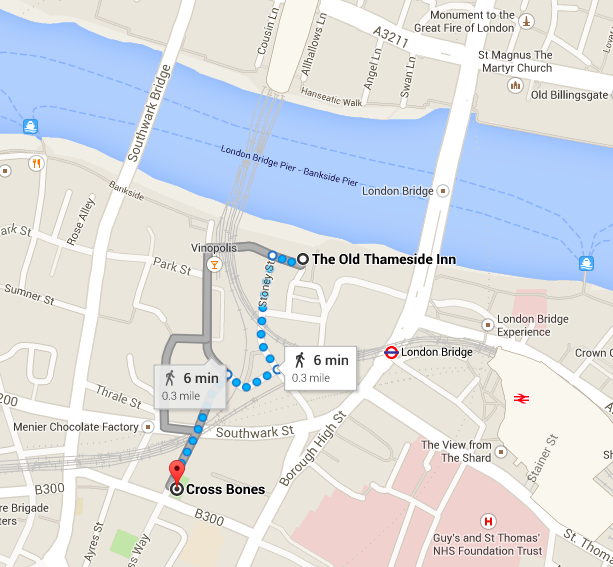 I am at the Old Thameside Inn, in Southwark. One of the oldest and most storied bits of the Big Smoke. One of the most medieval-felling bits. My lonely status here in the pub as a woman would as recently as the 1940s marked me as one of the many thousands of prostitutes who lay in Cross Bones, less than half a mile from where I”m enjoying a pint on the Thames. Now the King Edward, Arcadian. Rumbling dully by, and under London Bridge. This pub keeps beautiful peonies and well-trimmed olive trees in pots. Now the Avontur IV slides by, the only sound its wake and the water breaking on the bow. I’m writing in pink pen, in my copy of Thinking Fast and Slow. Newly completed, more than four months after I bought it on a whim before a shift. A woman in a silver slicker with a cane has just passed, who will shortly turn around at the porch’s dead end. Now the London Eye River Cruise. going upriver away from the sea. My pint of Autumn Red from Edinburgh has finished. It was an OK amber ale. Interesting that just by writing in London, my words take on more meaning and more weight. I could be a boring voice among the choruses of boring voices in a London anthology one day. I have one, a big bound book filled with letters and observations about the city stretching to the 1530s. “Circuited to Smithfield, in order to see the ceremony of opening Bartholomew Fair my the Lord Mayor–just finished” -1780, A London Year. I nip inside and return. Now a Clipper, with no passengers. ‘Making life easier’ by turning the mud over on the low-tide beaches below with its wake. I’ve spilled my Malbec due to the wobbling table, and it looks a bit too much like blood. A rising crescendo of sirens, from both sides of the river at once. I feel guilty about the £10.90 I’ve spent at this pub, but I’m trying to force myself to be a tourist in London for once. Now the Mercuria. A few brave ones in the drizzle on the top deck. I haven’t eaten anything today because I was busy crafting things for my wedding and buying quarter-cask Scotch whisky. The wine burns a bit. Now another Clipper, fleeing upriver from the sea this time. The girl next to me just left her purse open on the chair and her phone out. She’s Chinese, judging by the characters in her journal. She’s had almost a pint; she can be forgiven the massive lapse in judgement. Now the oddly-meaningless Salient slips by so silently I almost miss her. A cruel jape at my Linguistics dissertation, submitted today. St. Paul’s is over there, glaring at me for never yet visiting. I pass every night I work, but I’ve never seen the inside of the biggest church in London. There’s still too much to do in the city. The Monument. Westminster Abbey. The old walls. The Science Museum. The Korean exchange students behind me (identified by their calls of ‘어디? 어디?’) have ordered pints of Guinness that are probably cheaper than in Suwon and selfied sufficiently with them. My wine and my book are getting drizzle in them. Now the Thames Ribs boat is back, having thrilled its passengers with views of Canary Wharf and successfully avoided the ‘horrors’ of the real East London. The one I live in. The drizzle seems to be thickening, turning the City’s skyline a very vintage fray. Instagram, alive. The girl who left her bag is back, and on her second cigarette. Revelling in her freedom to openly smoke death sticks, as a woman. Scribbling idly with her watercolours on a page, painting a blue sky that is only in her head. Now the City Delta, with its floating greenhouse roof. I hope to do my birthday on the Thames again this year. Last year feels so far away and so close at once. Now the Putney River Bus, too far from its supposed Blackfriars terminus. A woman whose orange hennaed hair matches her bag photographs us all in the beer garden, as the sulphuric scent of lit matches washes over. Now another Clipper, and its noisy wake. For a moment, we’re at the seaside. Now the River bus, a different one, rumbling along rhythmically. Now another City cruise, marvelling slowly at Southwark. Slowly, slowly…and I’m a part of the historic London landscape. This cruise is on the ‘Millennium of Peace.’ What a farce, with Syria and Iraq and all the rest. The mobile seaside’s back, momentarily. Two or three more boats are edging toward us. I will go scan the mud from aloft for tokens of the past. I am part of the city, and I always will be. I will toss a hairpin in the River for some future mudlark. I was here. I was here. Typo in the blog? One of the most medieval-felling bits. Love the rest of it!